As with all the other The Body Shop shower gels, this has a nice, thick formula which lathers up really easily without needing to use too much. However my disappointment is with the scent. I naturally expected it to smell of honey - though perhaps a little sweeter and more artifical. The scent you actually get is very musky with a subtle honey note. 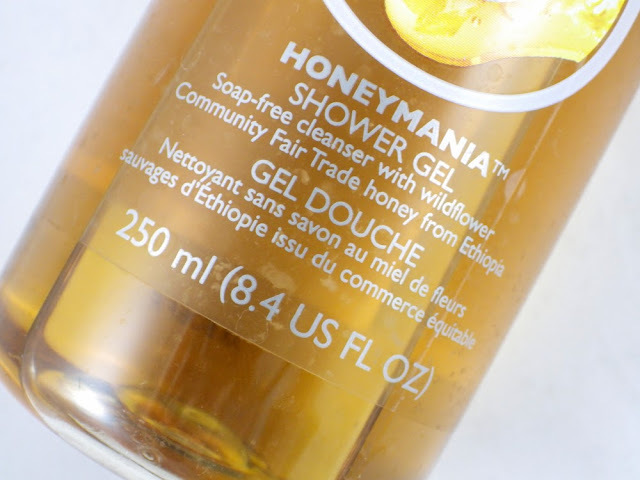 Having now looked at The Body Shop's website, they describe their Honeymania Shower Gel as having a "rich, floral scent" containing honey made from "the nectar of thousands of wildflowers". Looking at the ingredient list, Parfum/Fragrance is the fifth ingredient, followed by Miel/Honey. I will use the Honeymania Shower Gel, but I wish I had looked at the website description or taken the time to give it a quick sniff in store, as I don't think I would have bought it if I had. Have you tried anything from The Body Shop Honeymania range? I love The Body Shop's shower gels but this sounds like it might be a bit of a miss. Maybe some of the other products in the range smell better? Ah that's a pity I like this but I didn't know what to expect so I found the scent quite appealing!